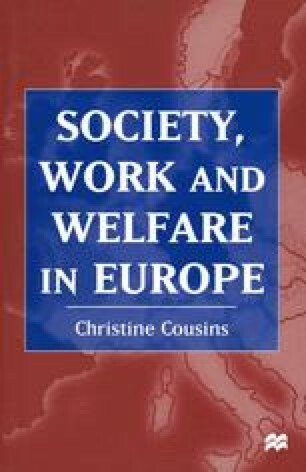 The previous chapters have reviewed cross-national similarities and differences and pressures for convergence and divergence in selected European countries, focusing on the changing relationship between work and welfare. Convergence between countries in all the substantive issues of work and employment considered in Part Two of the book was clearly evident - in labour market policies, in women’s increased labour market participation, in the operations of multinational companies, and in new production techniques. As we have also seen, though, there remain substantial divergences between countries in the extent and nature of the directions of change. In Part Three, with respect to women and social policies and social exclusion, there are also similarities between countries, for example in the recent entry of women into the public sphere and the gaining of citizenship rights, and the groups at risk of poverty or exclusion. But cross-national differences also remain significant here, especially with respect to the different development of social policies for women, the extent of the erosion of the male-breadwinner family model, and the different understanding of integration, citizenship, and exclusion in each country.